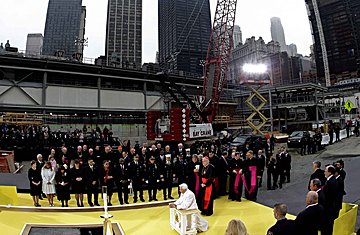 Pope Benedict XVI prays at Ground Zero in New York, April 20, 2008. We remember what we saw at Auschwitz. Even the most hardened Vatican reporter's voice lowers to a whisper when remembering Pope Benedict XVI's visit to the Nazi death camp on May 28, 2006. The German pontiff had arrived under threatening skies, which later turned to a soft but steady rain shower as he toured the grounds, met with Holocaust survivors and read his theological discourse that asked, "Why Lord did you remain silent?" But by the time Benedict was standing before a memorial by the ruins of a crematorium, the rain had stopped, and a vivid rainbow appeared across a distant field. If you measure the reign of a religious leader not by sermons or doctrinal documents, but by signs, that moment in Poland is arguably the most significant chapter of this three-year-old papacy. A German pontiff, 60 years later, crosses paths with a rainbow on the grounds of Auschwitz, a word from the sky for that which we have no words. Benedict's arrival at Ground Zero comes seven years after new, unspeakable violence, with its own religious dynamic. There was neither rain nor rainbow for this papal pilgrimage, but after five days of sunshine, the air was raw Sunday and a heavy fog covered even the top floors of the much smaller buildings that surrounded the massive crater left by the 19 followers of a blind faith. The press pool arrived an hour ahead of time, with a bagpipe band of law enforcement players warming up at street level. We walked down the ramp that brought us four stories below street level to the footprint of one tower of the World Trade Center, with a giant billboard above heralding the Freedom Tower, 2012, bordered by yellow cranes and cement foundation walls. In the ceremonial square, a single large pascal candle, used at Easter and funerals to represent new life and resurrection, stood above a small reflecting pool and a symbolic plot of earth. We soon realized that there would be only the participants of the ceremony  24 victims, survivors and first responders, a few local civic and church dignitaries  and our press pool, and so unlike some of these papal media appointments, we would be just a few yards away with a direct view. As the popemobile descended the ramp, the sound of bagpipes from above mixed with the sorrowful tune of a single cello player below. Benedict stepped out near the bottom of the ramp to walk the final 35 yards. Amidst all the surrounding concrete and work equipment, he looked particularly slight of build in simple, but heavy white papal vestments for the cold morning. His normally brisk walk was even brisker than usual, seemingly eager to arrive before the pascal candle to pray. Silently he knelt down, and remained on his knees, eyes open, but otherwise lost in his prayer for more than two minutes. The prayer he read was a simple and direct, a call for peace and comprehension: "God of peace, bring your peace to our violent world: peace in the hearts of all men and women and peace among the nations of the earth. Turn to your way of love those whose hearts and minds are consumed with hatred. God of understanding, overwhelmed by the magnitude of this tragedy, we seek your light and guidance as we confront such terrible events." The Pope shared a private moment with each of the 9/11 survivors and savers of lives, and was back in his popemobile. As he rolled away up the ramp and the bagpipes above began playing again, the 9/11 representatives wiped away tears and hugged each other. As photographers and cameramen put away their equipment, a local radio reporter was giving an instant report from his cell phone: "There's a humility about this man," he said, "that is quite something." he said. I walked up the ramp with my colleague Ignazio Ingrao of the Italian weekly magazine Panorama, who'd also been at the Auschwitz visit. This was his first time to New York, a place that he, like so many from different places, feel like they have gotten to know from afar, the Rome of our age. And yes, he'd watched this city on his television that September day, from a safe distance in modern-day Rome, just like this New Yorkborn reporter  and yes, also like the German-born future Pope. Two-thirds of the way to the top of the ramp, Ignazio and I turned around for another perspective. The "footprint" looked no smaller, and the remaining buildings no taller. It was still cold and the fog was hanging just as heavy as when we'd arrived, and there were still no words to be said.